Chrome vanadium insulated shafts with hardened & tempered tips. Contents: slotted 2.5 x 75mm, 3 x 100mm, 4 x 100mm, 5 x 125mm, 6 x 100mm & 8 x 175mm. Phillips: PH0 x 60mm, PH0 x 75mm, PH1 x 80mm, PH1 x 100 & PH2 x 100mm. Supplied in a carry case. 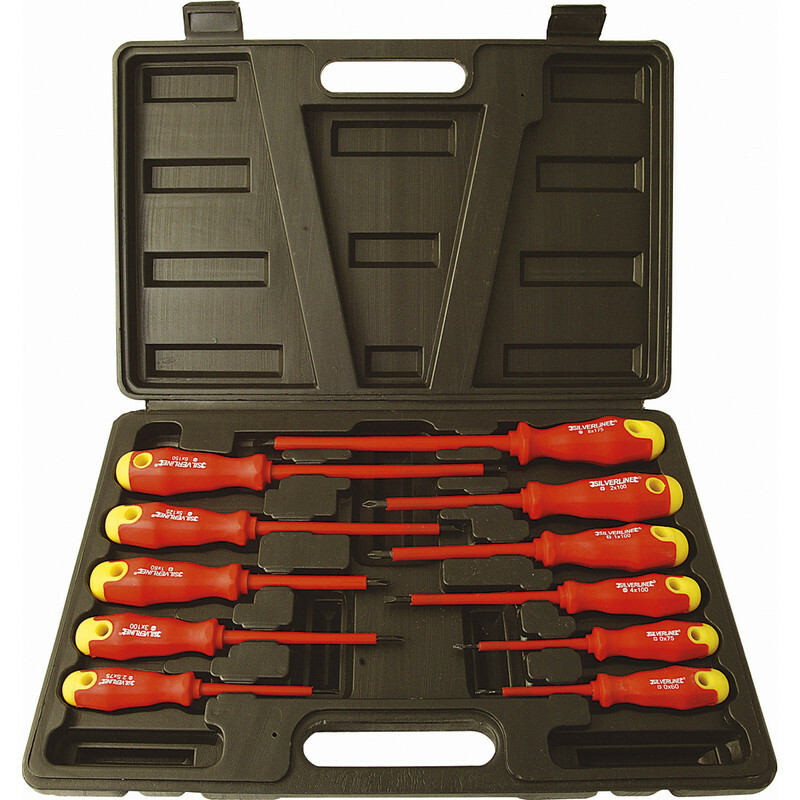 Soft Grip Insulated Screwdriver Set (11 Piece) is rated 4.7 out of 5 by 17. Rated 5 out of 5 by GI7PWQ from Great selection of screwdrivers. They arrived the next day as promised and appear to well made. Rated 5 out of 5 by toneil461 from Bargain Price! Used these for a few months now and have performed excellently. Rated 5 out of 5 by Albert T from Good product I bought this as I keep loosing them around the house, great value and they go back in the case so there not mislaid. Rated 4 out of 5 by Saaaaarrrrz from Just what I needed Just needed some screwdrivers for home DIY these are a lovely set and great value for money. Rated 4 out of 5 by Hoggy from Good for price Considering the price these appear to be good value. Obviously not for a professional electricion, very much DIY. Plastic handles not finished too well but hey!